Remember when you were a kid and there were three TV channels and three brands of toothpaste? Things sure have changed! The number of options we have when we buy a tube of toothpaste can be overwhelming. When it comes to choosing the best toothpaste for you, it’s important to think about your unique oral health needs. Once you identify your needs, it’s easier to navigate all of the choices! There are a lot of factors that come into play when choosing a toothpaste, including price and (especially where children are concerned) how it tastes. But the American Dental Association (ADA) has established a baseline of safety and effectiveness where oral care products are concerned, and the ADA seal is a good place to start! The ADA evaluates each product to make sure ingredients are safe and that it will actually help keep your teeth healthy. One of the most basic requirements is that approved toothpastes contain fluoride to help prevent cavities! Many of our patients come to us with problems with sensitivity to heat or cold. This happens when the tiny holes in the tooth surface take hot or cold foods or beverages straight to the underlying nerves. A number of producers have come up with specially formulated toothpastes the contain ingredients to cover those holes and block pain. These ingredients include potassium nitrate, strontium chloride or stannous fluoride. 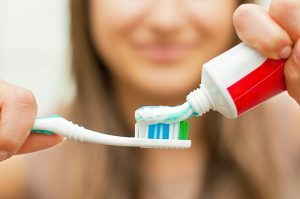 Remember, it usually takes around two weeks to a month of brushing twice a day for a desensitizing toothpaste to work. Some patients with sensitive teeth and gums also seek out toothpaste that doesn’t contain the common detergent sodium lauryl sulfate (SLS) which can cause irritation. So be sure to check the label if irritation is an issue for you. Everyone wants whiter teeth, and whitening toothpaste is bigger than ever. These products contain abrasives or chemicals that break down stains and remove the film that covers the enamel from all those fun things we love to eat and drink. Like desensitizing products, whitening toothpastes take around a month to make a visible difference. But in many cases, the abrasives can be a little harsh, so we don’t always recommend using them for too long. A couple of other tips: be sure to look for the ADA seal so you know you’re getting something that does what it promises. Also, whitening toothpaste works on a superficial and even the best brands will likely only get your teeth a shade or two whiter. If you want to make a more dramatic difference, talk to your dentist about in-office whitening. As we get more information about ingredients in toothpaste, some patients have concerns about potential negative health effects. Some of the ingredients that cause concern include the detergent sodium lauryl sulfate, the antibacterial ingredient triclosan and artificial dyes and sweeteners. Many natural toothpastes, available at health food stores and increasingly at drug and big box stores, instead contain old-fashioned ingredients like baking soda and charcoal, along with peppermint and other essential oils and plant extracts. There are plenty of high-quality natural options on the market, but remember, to get the ADA seal of approval, a toothpaste must contain fluoride. In some cases (as with very young children) there are reasons to go fluoride-free, but in most cases, sticking with a fluoride toothpaste is your best bet. Plenty of natural options contain fluoride without the other chemicals some patients want to avoid, and many have earned the ADA seal. Natural toothpaste is often pricier, but many patients feel it’s well worth the cost. Walk down the dental care aisle at any big box store and you’ll see that children’s toothpaste has grown exponentially. Parents have infinitely more choices than in decades past – with wild flavors and a range of natural ingredients. We do have a few rules of thumb: go fluoride-free before the age of two. After that age, fluoride is recommended – just be sure to use a small amount and remind your child to spit out For the 10 and under set, taste is usually the deciding factor. You’ll want to find a flavor your child can tolerate – or likes just enough not to swallow! Since children’s toothpaste tends to be more expensive, you should also note that responsible kids in the upper elementary grades and above are fine to use a small amount of adult toothpaste. Toothpaste Questions? Ask Your Dentist! Having options is great, but we know that sometimes too many choices can be overwhelming. If you have questions about choosing the right toothpaste for yourself or your child, call Hall & Butterfield today. As your family dentist, we know your history and your needs and can help you find the toothpaste that’s just right for you! © Copyright 2018 Hall & Butterfield Family Dentistry. All Rights Reserved.